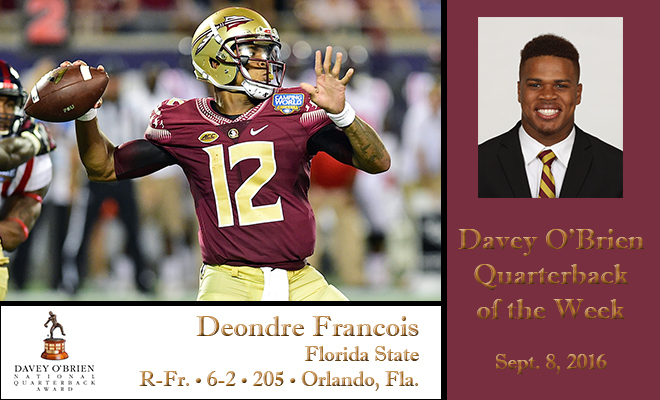 FORT WORTH, Texas (Sept. 8, 2016) – Florida State redshirt freshman Deondre Francois earned Davey O’Brien Quarterback of the Week honors following his first collegiate game, the Davey O’Brien Foundation announced Thursday. Francois, a native of Orlando, Fla., led the Seminoles to a 45-34 come-from-behind victory over No. 11 Ole Miss on Monday. 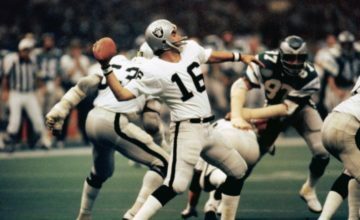 He finished the evening 33-of-52 passing for 419 yards and a pair of touchdowns against no interceptions. Francois also ran for 59 yards on nine carries. Florida State trailed 28-6 in the contest before Francois’ team reeled off 33 consecutive points en route to the largest comeback in FSU history. His 478 total yards of offense rank as the seventh-highest total in a single game in school history. In addition, his single-game passing yardage ranks 15th in FSU history, while the 419 yards are the second-most by a freshman in school annals. For his efforts, Francois was also named the ACC Offensive Back and Rookie of the Week. He is the third freshman to take home a Davey O’Brien weekly honor since the start of the 2015 season, joining UCLA’s Josh Rosen (Sept. 9, 2015) and Will Grier of Florida (Oct. 6, 2015). All FBS quarterbacks are eligible for the weekly award, which is determined by a subset of the Davey O’Brien National Selection Committee. The other “Great 8” quarterbacks in week one were: Ohio State’s J.T. Barrett, Jalen Hurts of Alabama, Louisville’s Lamar Jackson, DeShone Kizer of Notre Dame, Colorado’s Sefo Liufau, Greg Ward Jr. of Houston and Western Kentucky’s Mike White. The Davey O’Brien Foundation is celebrating its 40th anniversary in 2016. 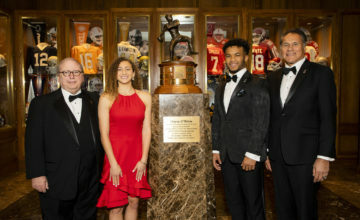 The Davey O’Brien National Quarterback Award winner will be announced on Dec. 8 during ESPN’s The Home Depot College Football Awards. The winner is not required to have won a weekly award during the season. A list of 16 semifinalists will be announced on Nov. 10, while the three finalists will be named on Nov. 22. 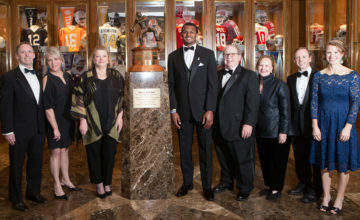 Three Florida State signal callers, Charlie Ward (1993), Chris Weinke (2000) and Jameis Winston (2013), have previously won the Davey O’Brien National Quarterback Award.